Description of "My Dear Son Book I (English) (eBook)"
Many children of the present generation stand to miss their grandma and the stories on valued based living. I have retold some old stories and introduced some new stories on value based living. I had nearly 650+ graduate engineers as my students whom I trained them and helped finding an employment. I made it a point to tell my students these stories. As a result, my students were recognized for their sincerity, honesty and good inter-personal relationship in their work space. I strongly recommend any one, irrespective of their age, who seeks to grow economically and in social status to read my books. I use short stories to convey the message to make reading both a pleasure and useful. N Natarajan 65, a retired Electronics Engineer worked for several organisations in Research, Infotech Industry and Government of India department in capacities ranging from technician to CEO through, Scientist, Engineer, Manager, General Manager position. Became a Technology trainer by accident and author by choice. I have four published title, in print media written in Tamil. They are : 1. My dear Son, 2. Connections. 3. Zen Stories, 4.Where is God? Nearly 10 more are ready and will be launched as e-books in Pothi.com. They include titles of Knowledge, Poverty alleviation, Middle class problems and solutions, Spirituality, understanding internal architecture of Linux operating system. Some of them are in Tamil and others in English. 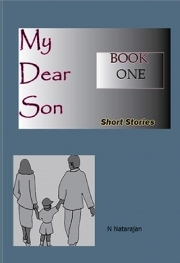 Reviews of "My Dear Son Book I (English) (eBook)"